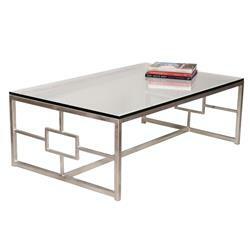 A hand wrought iron base with an antiqued silver leaf finish is inset with tempered glass to form the perfect table. I love my new beautiful new coffee table. The size is perfect, not too small not too big. It's sturdy and really pretty. I put my own rubber protectors on it to separate the glass from the metal and now I can put my feet up on it and the glass doesn't move. Very happy with this purchase.